7 Kids and Us: Pizza Hut $8.99 Summer "Box" Buster! Pizza Hut has a special offer just for the summer! What better way to feed a hungry troop than with the Pizza Hut $8.99 Summer "Box" Buster! 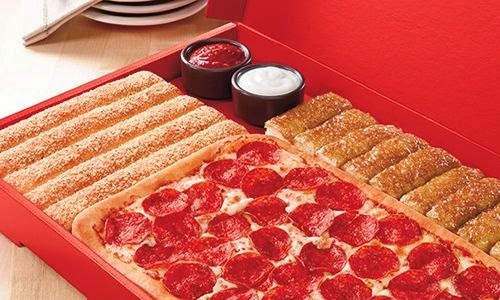 The Box Buster includes one medium pan pizza with one topping, five breadsticks and ten cinnamon sticks! Appetizer, dinner and dessert for one low price. I purchased this box for my two boys and we all ate dinner, and even had leftovers! Such a great deal. To order from Pizza Hut, visit PizzaHut.com, which was recently redesigned to enable faster ordering than ever before. Pizza Hut has the largest platform of ordering channels of any national pizza chain, including apps for iPhone, Windows and Android, as well as Xbox 360, iPad and a mobile site.